An editorial cartoonist often uses humor to make light of a serious situation. 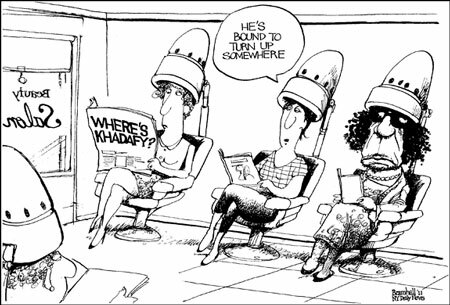 How do the cartoonists take a lighthearted approach to a serious situation? Libyan rebels have been fighting autocratic leader Moammar Gadhafi’s forces for several months. On Tuesday, they claimed victory as they took control of most of the capital city of Tripoli, including Gadhafi’s huge compound. 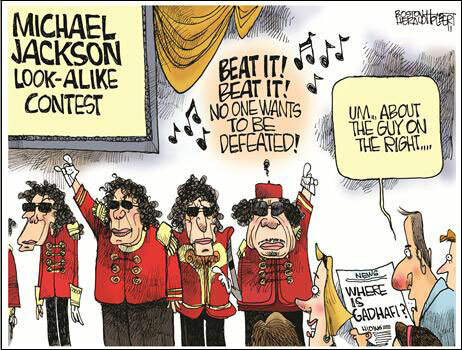 However, Gadhafi disappeared and rebels have continued to search for him, offering a $1.7 million reward for his capture, dead or alive. His whereabouts have remained a mystery, even as Gadhafi himself addressed the nation in a radio broadcast, vowing to fight on.